Over 10 years of Back Issues Online! Gridiron Strategies is the complete resource for football coaches at every level of competition...from grade school to the pros. This six-times-a-year publication is written by football coaches for football coaches. 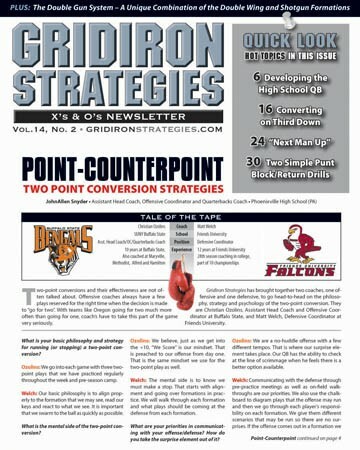 Each issue is like a mini football clinic, offering the latest strategies, plays, ideas and management tips to help you build a successful program. Whether its on the field, in the locker room or in the weight room, Gridiron Strategies is like having an extra assistant coach right at your fingertips! Subscribe Today and get the next 6 digital issues and 1 full year of online access for $25.00 (US Only). Outside the United States call (561) 627-3393 x11.